ALPOLIC®/fr is a fire-retardant panel composed of two thin panels of aluminum laminated to either side of a mineral-filled thermoplastic core. 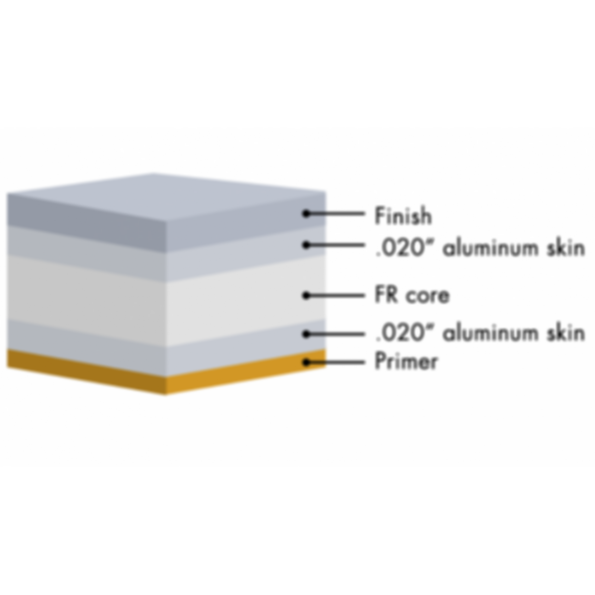 The aluminum surfaces have been coil-coated before bonding with an advanced Lumiflon® FEVE resin in a variety of Valflon® finishes and colors, supplied by Valspar. We also offer fire-retardant materials in our HD heavy-duty series and natural metal MCM composites. Fire safety is important for any building project, and a fire-retardant panel is typically required in buildings that exceed a minimum height as specified by applicable codes. ALPOLIC®/fr is one of the most advanced fire-retardant materials available and is IBC-listed to ensure compliance with many fire codes worldwide. Offered in an extensive choice of attractive options, this affordable material is one of the most popular choices for exterior fire-retardant cladding, seen in many landmark projects around the globe. ALPOLIC®/fr sets the industry standard for fire safety while offering the same finish choices and ease of fabrication as our standard ALPOLIC®/PE panels. Stock ALPOLIC®/fr panels are 4mm thick and available in widths of 50" and 62" and lengths of 146" and 196". Custom lengths and thickness are also available. A wide range of stock colors are available for immediate delivery, with unlimited possibilities for custom color matching. We also offer metallic, mica, prismatic and multi-color finishes; stone and timber effects; decorative metal finishes; natural metals; and anodized aluminum.